Olivia never expected to be a widow at forty. A year after her husband Carl's unexpected death, Olivia is still trying to find her footing and move forward with her life. Twenty years ago, as a college student in New York City, she fell deeply in love with Andrew and envisioned a completely different life but a difficult decision led her back to her hometown sweetheart and a comfortable, if unexciting, marriage. When a business trip takes her back to NYC for the first time since those exciting college days, she impulsively reaches out to the man who once held her heart. After the way their relationship ended, is a second chance possible? Arriving in New York before Andrew returns from a business trip, Olivia spends her first day visiting those spots that were special to her when she lived there before. It's at one of those places, a bridge in Central Park, that she encounters Brett, a well-known, professional baseball player at a crossroads in his career. He's younger, handsome, full of joy and enthusiasm and she has no idea who he is but the attraction is immediate...and mutual. Has fate given her a second chance with her first love or steered her to a new, unexpected path? This was my first book by Elyse Douglas but it won't be my last. It's on the short side - 183 pages - but is no less enthralling for its length. I was captivated by this richly emotional story of Olivia's journey of self-discovery and love. I think we've all probably second-guessed a decision at some point in our lives or wondered "what if?" I know I have. Douglas skillfully steers Olivia through those questions as she travels the path of discovery to who she is and who she wants to be. The characters are fully dimensional, vibrant and brought to life by the author. I could feel their emotions: the sorrow, confusion, anger, and joy that are all important facets of the journeys they travel. The secondary characters are also richly drawn and realistic, especially Olivia's supportive father-in-law, Taylor Scott and her college-age daughter, Emily. 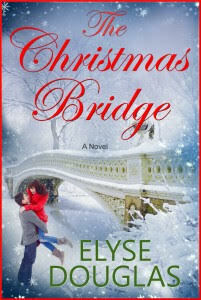 If you're looking for a feel-good contemporary romance that will make you laugh, cry, and cheer for happy endings, I highly recommend The Christmas Bridge. Sounds very good. Thanks for clueing me in. sounds very sweet, but I'm always leery of romances with large age differences. Not saying it's not possible just not that plausible. That tends to bring me out of a romance fast... regardless of who's older, that just doesn't ring true to me. I couldn't imagine dating some one significantly younger than me. What would you have in common? LOL... thanks for the recommndation! It's not a significant age difference, erin. Only six years. I am working on my Christmas book pile. Will have to read this one. This time of year I really enjoy reading heartwarming stories. This sounds like a wonderful holiday read.